Come join us in chapel this morning for Holy Communion. Students are invited to stop by this informal meet and greet to learn about service opportunities. Representatives from MN Math & Reading Corps, Peace Corps, College Possible, Conservation Corps and Luther Volunteer Corps will be on campus. 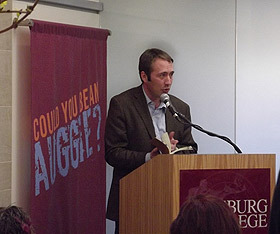 Augsburg College celebrated its new Master of Fine Arts in creative writing with a reading by Stephan Clark from his newly published book Vladimir's Mustache and Other Stories. Clark is an assistant professor of English and a member of the MFA faculty. In 2013, the MFA will offer four genres: fiction, creative nonfiction, poetry, and screenwriting. A fifth genre, playwriting, will be added in 2014. A national book prize and concentrations in publishing, teaching and translation will also begin that year. "An Augsburg MFA leverages our distinguished faculty and the strength of our undergraduate programs while delivering things no other program in Minnesota or the surrounding states offers, including a book prize, a screenwriting track, and low-residency programming for all four of our genres," said Augsburg College President Paul C. Pribbenow. "The program and its format show the ability of our school to meet marketplace demand and to use technology to increase accessibility and contain costs." The Augsburg MFA includes three 10-day summer residencies, complemented by online coursework as well as individualized mentorship semesters. During the residency, students will participate in daily workshops, readings, and mini-courses focused on literary craft, career skills in teaching, editing, publishing, book arts, advertising, translation, adaptation, and new media. Learn more on the MFA admissions website. Clark is a writer of fiction, creative nonfiction, and screenplays. Stories from Vladimir's Mustache were published in such literary journals as Witness, Ninth Letter, and Cincinnati Review. His creative nonfiction has been recognized as notable in Best of the Web 2009 and Best American Essays 2009 and 2010. Professionally represented as a screenwriter while living in Los Angeles, Clark has optioned two scripts and seen his screenwriting honored by the Monterey County Film Commission and Francis Ford Coppola's American Zoetrope film studios. Clark worked as a print and radio journalist before returning to academia. Learn more about Clark and his work at http://stephanclark.net/.